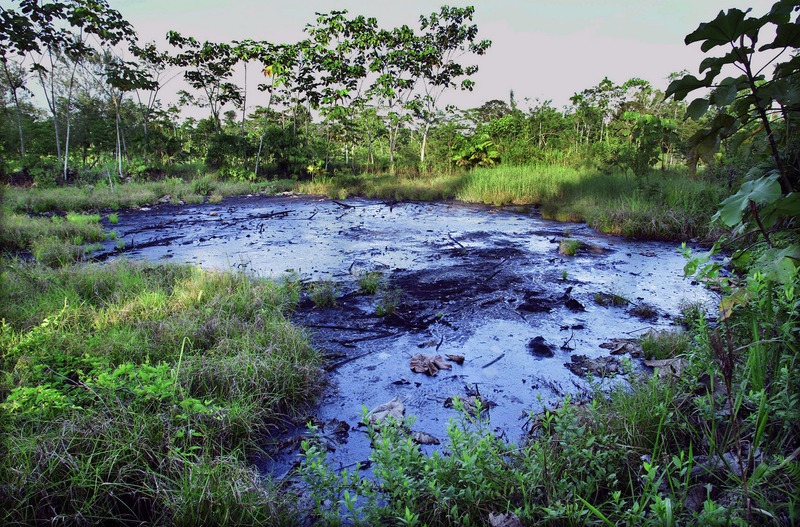 (Español, abajo) Abstract of the conflict The US based Chevron (formerly Texaco) is responsable for the damages resulted from the extracting activities that have been carried out since 1964 in over 1.5 million hectares in the Ecuadorian Amazon. The company admittedly spilled over 60 billion litres of toxic waste and approximately 650,000 barrels of oil in the area. The reparation, imposed by the Ecuadorean government, was carried out poorly, and resulted in a mere covering up which has had no effect on the damage and its negative effects, which still endure. In the affected areas cancer rates are extraordinarily high, and the indigenous peoples, including the Tetetes and Sansahuari who previously lived in the area are now extinct, while the Cofanes, Sionas and Siekopai risk a similar fate, as they have fled to other regions. Moreover, local farmers were left with infertile land and lost their livestock, which is dying or has died due to the contamination. 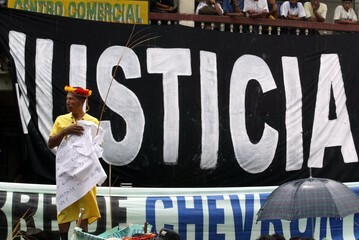 In 2013 the Supreme Court of the Republic of Ecuador condemned Chevron to pay 9.5 billion dollars of damages, thus recognizing that the company’s activities violate the Universal Declaration of Human Rights, the International Covenant of Civil and Political Rights, the International Covenant of Economic, Social and Cultural Rights, as well as the Constitution of the Republic of Ecuador – the first in history to recognize the rights to nature. Chevron, however, has refused to pay, claiming that the Ecuador judgment is “illegitimate and unenforceable” despite their previous request to be trialled there. History of the conflict In 1964, the “Junta Militar” that governed Ecuador granted Texaco Petroleum Company a concession of approximately one and a half million hectares in the Ecuadorian Amazon for the exploration and extraction of hydrocarbons. Already in the initial exploration phase, the company perforated up to 350 oil wells that demanded an immense quantity of drilling fluid, a mixture of very toxic products used to lubricate the drill bits. This fluid was stored in over a thousand uncovered holes in the ground with no protection against its filtering. In the production phase, these holes were later used to deposit as well the “produced water” (the water released during the oil production) instead of the proper steel tanks that would have protected the environment, evidently resulting in huge savings for the company. Texaco then constructed a draining system that conducted these waters to the closest river, exposing the whole region to evident damage, a fact admitted by the legal representative of Texaco, who claimed that the company had spilled over 16 billion gallons of this water . The contamination of the ground and water of a region with high biodiversity and plentiful resources affected thousands of people that directly depended on the environment. The human right to food of the population was drastically violated, given their high dependency on these resources. The health risk posed by the toxicity in the environment resulted in a much higher rate of cancer among the inhabitants as well as several kinds of internal and external infections and problems in the respiratory, reproductive and circulatory systems. 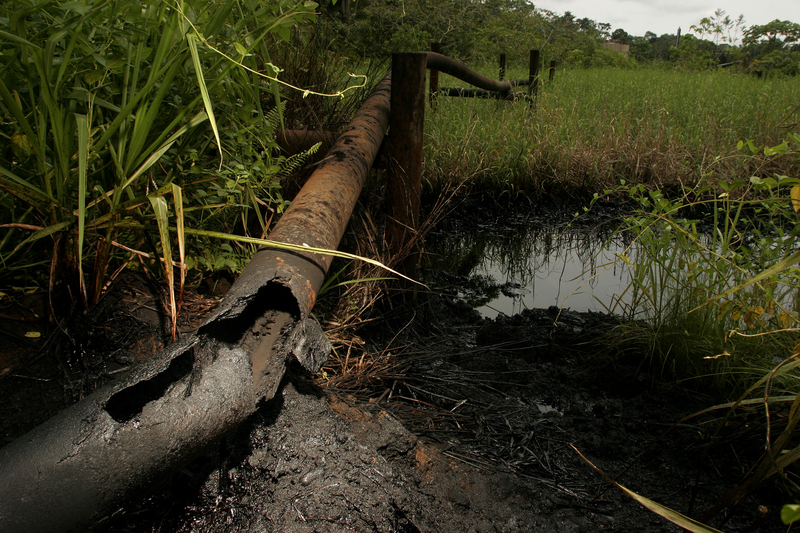 The relation between the oil activity in the area and the increase of these illnesses has been thoroughly documented. The economic impact should also be taken into account, as the rural population were left with infertile lands and conditions that would very unlikely sustain the life of their animals. In 1992, Texaco abandoned Ecuador. Three years later, Texaco did sign a $40 million remediation agreement with the Government of Ecuador that allegedly cleaned one third of the well sites, but the remedy was poorly executed and basically consisted in only covering them up with ground, more residues, tires, concrete, and in many cases some vegetation. Chevron Corporation and Texaco INC merged in 2001 into Chevron Texaco Corporation, and four years later the company adopted the sole name of Chevron Corporation. Attempts of Access to Justice Litigation processes took place since 1993, when up to 30,000 affected local residents and native communities filed a class-action lawsuit against Texaco in the District Court in New York for damages caused to their health and the environment. After nine years, the US courts finally accepted Chevron argument and rejected the initial lawsuit claiming that it was not the proper jurisdiction for the case. As a result, the affected initiated a new case in the Ecuadorian Amazon town of Lago Agrio. 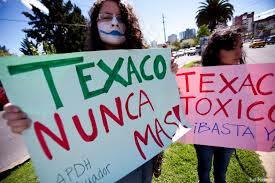 The new lawsuit in Ecuador claimed that Texaco (now Chevron) had knowingly used obsolete, improper and polluting practices in violation of the Ecuadorian law, which specifically demanded the use of “modern and efficient technology” and avoidance of harm to the ecosystem. 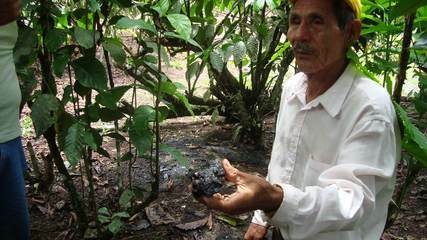 In 2011 in a landmark judgement the local Sucumbios court sentenced Chevron to pay 9.5 billion USD in reparation measures (which would be doubled if the company did not publicly apologize) for the contaminated ground and water, for the creation of a health program to attend the affected population and for the recovery of fauna, flora and lost culture, to the Frente de Defensa de la Amazonia. The Ecuadorean Supreme Court later confirmed the court decision in 2013. However, Chevron has not complied with the sentence and refuses to pay the fine using all their resources and influence to escape justice. The role of the Architecture of Impunity During the 20 years of legal battle, Chevron has tried to pull all the possible strings to avoid the affected population’s access to justice. Several Wikileaks cables have shown their efforts to bring the American government to pressure for a favorable sentence (2). These cables even show contacts with officials from the Government of Ecuador offering to implement social projects to guarantee support in bringing down the case (3). Other leaks include internal videos from Chevron that show scientists hired by the company trying (unsuccessfully) to find non-contaminated soil days prior to the judge’s visit to the affected areas (4). Ever since the sentence was heard, Chevron has used all its resources to discredit the legal team of the affected populations as well as the Ecuadorian State and its judicial system. For instance, they started a legal (non-jury) proceeding in a New York court that accused the American lawyer representing the Ecuadorian communities, Steven Donziger, of alleged bribery and other corrupt misconduct during the trial. The company precisely appealed to the RICO (Racketeering Influence and Corrupt Organizations) law to prevent the judgment’s enforcement in the United States. Chevron’s main allegation was that plaintiffs’ lawyers colluded with Ecuadorian officials to obtain a judgment against the corporation and that they even ghostwrote the text of the final ruling. On March 7, 2011, Judge Kaplan issued a preliminary injunction banning the execution of any Ecuadorean court judgment in any country outside Ecuador. The decision was struck down by the U.S. Second Circuit on September 19, 2011, which annulled Kaplan’s decision ruling that the RICO law was not meant to make its courts act “as transnational arbiters” (Court opinion of January 26, 2012). Moreover, the fraud allegations were mainly based on the deposition of Chevron’s “star-witness”, Mr. Alberto Guerra, a former Ecuadorean judge who first heard the Aguinda case. After having left this institutional position, he was contracted by Chevron to testify on its behalf, describing inexistent collusive dealings with the Ecuadorean plaintiffs before U.S.courts. However, Guerra’s testimony was contradicted by his own outstanding affirmations before the International Arbitration Panel in Washington DC during the Phase II of the Arbitrationbetween Chevron Corp. and Texaco petroleum Co. and the Republic of Ecuador (PCA CaseNo.2009-23, April 21- May 8, 2015), initiated in 2009 by the company. Indeed, simultaneously,the transnational has requested international arbitration against the State of Ecuador, utilizing theBilateral Treaty for the Protection of Investors between Ecuador and the United States. The BIT, however, was signed in 1997, years after Texaco left the country and thus committed its wrong doings. Despite suspicious links between some of the arbitrators and Chevron (and considering this arbitration mechanism has been known to be favorable to corporations) (6), the latest decision surprisingly rejected Chevron’s argument, as it ruled that the claims of private citizens were valid under Ecuadorian law and that they were not covered by the settlement (7). Actually, the arbitral panel cannot affect in any way the Aguinda ruling, because it has no jurisdiction over the Aguinda plaintiffs. In addition, the evidence presented by the Republic of Ecuador during the Arbitration demonstrates once again that the company’s claims of fraud are completely unfounded. Indeed, the findings contained in the Supplemental Expert Report of J. C. Racich, released on November 7, 2014, for the Republic of Ecuador, contradicted those provided by Chevron (the Lynch’s Zambrano Report of 2014), therefore undermining claimants’ conclusions. The affected communities continue to use legal strategies to access justice. Apart from the already mentioned, the campaigns are also suing the company in Argentina, Brazil and Canada, where the company still has assets and could thus guarantee a payment. With regards to the enforcement abroad strategy, it must be mentioned the crucial judgments plaintiffs obtained on September 4, 2015, released by the Supreme Court of Canada at last instance in the Chevron Corp. v. Yaiguaje case. The Court unanimously recognized the Canadian jurisdiction over the judgment enforcement claim made by plaintiffs, confirming a second instance’s decision. These two last decisions contradicted the Canadian trial judge’s ruling, who previously pointed to Chevron Corporation’s claimed lack of assets in the country. Instead, the Court of Appeal in Ontario at second instance recognized the due assistance that courts worldwide shall grant to the victims. For its part, the Canadian Supreme Court’s ruling addresses two main issues: firstly, whether and under what conditions it has jurisdiction to decide on the recognition and enforcement of the Ecuadorean judgment; secondly, the court analyzes the existence of jurisdiction over the subsidiary, Chevron Canada. The answer of the Court is affirmative on the two fronts. Even if the Court’s verdict is only a step in the process of wining plaintiffs’ claim for compensation in Canada, the decision settled an important precedent not only for the Ecuadorian victims but also for other affected people fighting Chevron around the world. What Justice could do: a say from the PPT In a hearing that was held in Geneva in June 2014, the Permanent People’s Tribunal (PPT) listened to the testimony of Pablo Fajardo and Oscar Herrera, from Unión de Afectados por Chevron-Texaco - UDAPT. Considering the evidence brought before the judges by these witnesses, the Tribunal recognized the actions of the transnational corporation as another example of violations of human and people rights. In line with its full judgement of Madrid, in May 2010, and just a few months before the session that was held in Mexico in December 2014, the PPT underlined once again how transnational corporations, including Chevron, systematically violate human and peoples’ rights to their own profit. In the same line, the PPT recognized in this widespread practice the current shortcoming of international law, namely the impossibility of accessing justice and obtaining a remedy that is increasingly becoming an unbearable burden for affected communities, as well as for the laws that are supposed to give them shelter. In the same spirit, the PPT acknowledged the necessity to improve international legislation, including through a binding treaty on transnational corporations, and a Peoples’ treaty, in order to hold transnational corporations accountable for their actions. Since several years hundreds of movements, NGO’s and affected communities are fighting to dismantle corporate power and proposed a binding treaty for transnational corporations and human rights. 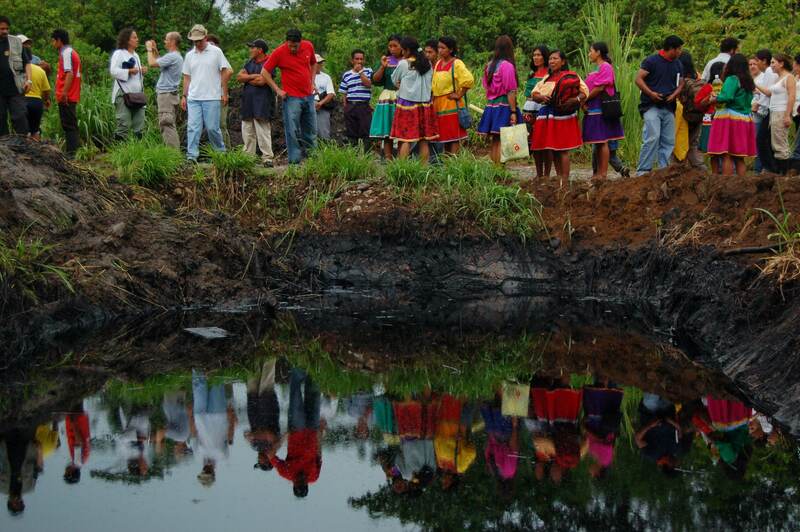 On June 2014, the UDAPT participated in a written presentation of Ecuadorian Chevron case before the UN Human Rights Council among several other cases. At this session, on the initiative of Ecuador and South Africa, the UN Human Rights Council voted a resolution for the elaboration of an international legally binding instrument on Transnational Corporations and Other Business Enterprises with respect to human rights. In July 2015 the UN „Intergovernmental working group on transnational corporations and other business enterprises with respect to human rights“ had its first session where several NGO’s could contribute with their testimonies. Many of them are part of the campaign „Stop Corporate Impunity“ in which the Ecuadorian Chevron case has become an emblematic example to demand the in force corporate accountability. Different measures on international level could be examined to enforce sentences that can not be executed on national level for different reasons, such as economic and political interests. One of them is to change the Statue of Rome in order to include environmental crimes as crimes against humanity. October 2015, the UDAPT made a complaint against the Chevron CEO before the International Criminal Court in this perspective. Since then other movements such as the End Ecocide platform plead for a change of the Statute of Rome in order to include Ecocide as a crime against humanity. Other organizations and personalities work to promote the creation of an International Court of Environmental justice. Resumen del conflicto La empresa acusada es la estadounidense Chevron (antes Texaco), por los daños ocasionados por sus actividades de extracción de crudo y gas en más de un millón y medio de hectáreas de la Amazonia ecuatoriana desde 1964. La empresa admitió haber arrojado más de 60 mil millones de litros de residuos tóxicos y alrededor de 650 mil barriles de crudo en la zona. La reparación, impuesta por el Estado Ecuatoriano, fue mal realizada y consistió tan solo en un recubrimiento de las fosas que hasta hoy no ha tenido ningún efecto paliativo de los perjuicios, que todavía continúan. En las áreas afectadas se registran índices de cáncer extraordinariamente altos, y los pueblos Tetetes y Sansahuari que habitaban la zona se extinguieron, mientras que los Cofanes, Sionas y Siekopai corren similar peligro, ya que tuvieron que huir a otras zonas. Además, los campesinos locales quedaron con tierras infértiles y perdieron sus animales de corral, que murieron y siguen muriendo por la contaminación. En 2013, la Corte Nacional Suprema del Ecuador condenó a Chevron a pagar 9.500 millones de dólares en concepto de daños y perjuicios, reconociendo que las actividades citadas violan dramáticamente la Declaración Universal de los Derechos Humanos, el Pacto de los Derechos Civiles y Políticos, y el Pacto de los Derechos Económicos, Sociales y Culturales, así como la Constitución de la República del Ecuador – la primera en el mundo en reconocer derechos a la naturaleza. La empresa, sin embargo, se ha negado a pagar, alegando que la sentencia de Ecuador es “ilegítima e inaplicable” a pesar de su petición previa de ser juzgados allí. Historia del conflicto En 1964, la Junta Militar que gobernaba el Ecuador entregó en concesión a Texaco Petroleum Company más de un millón y medio de hectáreas de la Amazonía ecuatoriana para la exploración y explotación de hidrocarburos. Ya en la fase de exploración inicial, la compañía perforó hasta 350 pozos extractores que necesitaban gran cantidad de ‘lodos de perforación’, una mezcla de productos altamente tóxicos utilizados para lubricar la broca de los taladros. Estos deshechos se depositaban en cerca de mil agujeros en el suelo sin ningún tipo de recubrimiento que impidiese la filtración por sus paredes. En la fase de producción, estas fosas eran posteriormente reutilizadas para depositar el ‘agua producida’ (el agua generada durante la producción del petróleo) en lugar de los tanques de acero apropiados que hubieran garantizado la seguridad del medioambiente, lo que evidentemente supuso un gran ahorro para la compañía. Ésta construía después un elaborado sistema de drenaje que conducía las aguas al río más cercano, exponiendo toda la zona a una inevitable contaminación, un hecho que el propio representante legal de Texaco reconoció al admitir que la empresa había vertido más de 16 mil millones de galones de esta agua en los ríos y esteros de la zona (1). La contaminación de la tierra y el agua de una región de alta biodiversidad y abundantes recursos afectó a las miles de personas que directamente dependían de su entorno. Su derecho humano a la alimentación fue drásticamente violado, dada su alta dependencia de estos recursos. El riesgo para la salud de la población causado por la toxicidad del ambiente resultó en una incidencia de cáncer mucho mayor, así como en varios tipos de infecciones internas y externas y problemas en los sistemas respiratorio, circulatorio y reproductivo. La relación entre las actividades petroleras en la zona y el aumento de estas enfermedades ha sido ampliamente documentada. Así mismo, el impacto económico tampoco puede ser olvidado, pues la contaminación dejó a la población mayoritariamente rural con tierras infértiles y animales que no pueden sobrevivir a esas condiciones. En 1992, Texaco abandonó el Ecuador. Tres años después, la transnacional firmó un acuerdo de remediación de 40 millones de dólares con el Gobierno del Ecuador que supuestamente limpió un tercio de las zonas afectadas, pero el remedio fue mal ejecutado y consistió tan solo en cubrir las fosas con tierra, más residuos, caucho, cemento y en muchas ocasiones con vegetación. Chevron Corporation y Texaco INC se fusionaron en 2001 en Chevron Texaco Corporation, para adoptar cuatro años después el nombre único de Chevron Corporation. Intentos de acceso a la justicia El litigio contra la compañía comenzó en 1993, cuando más de 30 mil residentes locales y comunidades nativas afectadas presentaron en un Tribunal de Distrito de Nueva York una demanda por daños a su salud y al medioambiente. Tras nueve años de disputa, las cortes estadounidenses finalmente aceptaron el argumento de Chevron y rechazaron la demanda inicial, alegando que los EE.UU. no era el foro adecuado para el proceso. Los afectados comenzaron entonces un nuevo caso en la ciudad de Lago Agrio, en la Amazonía ecuatoriana. La nueva demanda denunciaba que Texaco (ahora Chevron) había utilizado deliberadamente prácticas nocivas y contaminantes, violando así la ley ecuatoriana, que específicamente demanda evitar los daños al medioambiente y requiere la utilización de “tecnología moderna y eficiente”. En 2011, la Corte de Sucumbios emitió una decisión emblemática que condenaba a Chevron a pagar 9,5 mil millones de dólares (cantidad que sería doblada de no haber arrepentimiento público) en medidas de reparación de los suelos y el agua contaminada, en un programa de salud capaz de atender a las víctimas de cáncer y en recuperar la flora, la fauna y la cultura perdida, al Frente de Defensa de la Amazonia. La decisión fue ratificada por la Corte Nacional Suprema en 2013. Sin embargo, Chevron sigue sin reconocer la sentencia y se niega a pagar, utilizando todos sus recursos e influencia, mucho mayores que los de las comunidades afectadas, para evitar la multa. El papel de la Arquitectura de la Impunidad Durante los más de 20 años de batalla legal, Chevron ha tratado de impedir el acceso a la justicia de los afectados por todos los medios. Varios cables de Wikileaks han demostrado sus esfuerzos para que el gobierno estadounidense presione por una sentencia favorable (2). Estos cables detallan incluso contactos con altos oficiales del Gobierno del Ecuador, en los que la empresa ofrecía implementar una serie de proyectos sociales para así garantizar su apoyo en la resolución del caso (3). 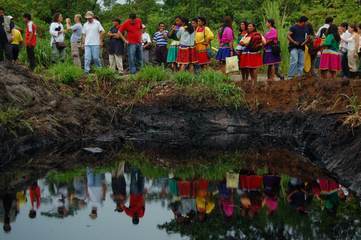 Otras filtraciones más recientes incluyen videos internos de Chevron que retratan a científicos contratados por la empresa tratando de encontrar, sin éxito, tierras no contaminadas días antes de la visita del juez a las áreas afectadas (4). Desde que la sentencia fue dictada, Chevron ha utilizado todos sus recursos para desacreditar a los representantes legales de la población afectada, así como al Estado y la justicia ecuatorianas. Por ejemplo, comenzaron un proceso legal (sin jurado) en un tribunal de Nueva York que acusó al abogado americano de los afectados, Steven Donziger, de ser responsable de sobornos y otras prácticas corruptas durante la demanda. Donziger ha rechazado todas las acusaciones y el caso está siendo apelado actualmente, aunque, de ser ratificado, podría suponer un precedente peligroso para que en el futuro otras corporaciones puedan evitar la responsabilidad por daños medioambientales (5). Paralelamente, la transnacional ha solicitado arbitraje internacional contra el Estado ecuatoriano, defendiéndose tras el Tratado Bilateral para la Protección de Inversiones entre Ecuador y EE.UU. Este Tratado, sin embargo, tomó efectos prácticos en 1997, varios años después de que Texaco abandonara el país y por lo tanto cometiese sus acciones. A pesar de los supuestos enlaces entre algunos de los árbitros y Chevron (y considerando que este mecanismo de arbitraje suele ser favorable a las corporaciones) (6), la sorprendente decisión más reciente rechazó el argumento de la transnacional, puesto que confirmó que las demandas de ciudadanos individuales eran válidas bajo la legislación ecuatoriana y que no estaban cubiertas en el anterior acuerdo entre la empresa y el país latinoamericano (7). Las comunidades afectadas continúan utilizando estrategias legales para acceder a la justicia. Aparte de las ya mencionadas, las campañas de afectados también han denunciado a la compañía en Argentina, Brasil y Canadá, lugares en los que Chevron sigue teniendo activos y que pueden garantizar el pago de la multa. Lo que la justicia podría hacer: una opinión del TPP En junio de 2014, UDAPT participó en una presentación escrita del caso Chevron Ecuador ante el Consejo de derechos humanos de las Naciones Unidas entre varios otros casos. En esta sesión basándose en la iniciativa de Ecuador y Sudáfrica, el Consejo de derechos humanos de las Naciones Unidas votó una resolución para la elaboración de un instrumento internacional vinculante para las empresas transnacionales y otras empresas comerciales con respecto a los derechos humanos. En julio de 2015 UN "Grupo de trabajo de Intergubernamental sobre las empresas transnacionales y otras empresas con respecto a los derechos humanos" tuvo su primera reunión donde varias ONG podrían contribuir con sus testimonios. Muchas de ellas son parte de la Campaña Global Para Desmantelar el Poder de las Transnacionales y poner Fin a la impunidad en que el caso Chevron Ecuador se ha convertido en un ejemplo emblemático para exigir la responsabilidad social de las transnacionales. Diferentes medidas a nivel internacional podrían ser examinadas para hacer cumplir las sentencias que no pueden ejecutarse a nivel nacional por diversas razones, tales como intereses económicos y políticos. Una de ella consiste en cambiar el Estatuto de Roma para incluir los delitos ambientales en tanto que crímenes contra la humanidad. En octubre de 2015, UDAPT hizo una denuncia en contra del CEO de Chevron ante la Corte Penal Internacional en esta perspectiva. Desde entonces otros movimientos tales como la plataforma End-Ecocide abogan por un cambio del estatuto de Roma para incluir el ecocidio como un crimen contra la humanidad. Otras organizaciones y personalidades trabajan para promover la creación de un tribunal Internacional de justica ambiental. En la sesión en Ginebra de junio, 2014, el Tribunal Permanente de los Pueblos (TPP) escuchó el testimonio de Pablo Fajardo and Oscar Herrera, de Unión de Afectados por Chevron-Texaco - UDAPT. De acuerdo a lo expuesto ante los jueces del tribunal, éste reconoció las acciones de la corporación transnacional como otro ejemplo de violaciones de derechos humanos y de los pueblos. De acuerdo a la sentencia de Madrid, en mayo de 2010, y unos meses antes de la sesión que tuvo lugar en México en Diciembre 2014, el TPP resaltó de nuevo cómo las corporaciones transnacionales, incluida Chevron, violan sistemáticamente estos derechos para su propio beneficio. El tribunal reconoció en esta extendida práctica la evidente limitación del derecho internacional. La imposibilidad del acceso a la justicia y a obtener remediación está convirtiéndose en una carga cada vez mayor para las comunidades afectadas, así como las leyes que deberían protegerlas. Así mismo, el TPP reconoció la necesidad de mejorar la legislación internacional, incluyendo un tratado vinculante para las corporaciones transnacionales y un Tratado de los Pueblos, para que así estas empresas sean consecuentes con sus acciones. Project Details Texaco extracted up to 1.5 billion barrels of oil. The contamination of of the Amazon forest left millions of gallons of oil in the soil, 20 million cubic meters of polluted gas into the air and hundreds of contaminated water pools and open air waste pits left abandoned without any covering or cleaning. Texaco extrajo hasta 1,5 mil millones de barriles de crudo. La contaminación de la Amazonía dejó millones de galones de crudo en los suelos, 20 millones de metros cúbicos de gas contaminante en el aire y cientos de piscinas de agua y vertederos abandonados sin cubrimiento ni limpieza. Development of Alternatives Reparación del suelo, reparación social y cultural para los pueblos indígenas, reparación de los ecosistemas, dotación de agua segura para las comunidades afectadas y provisión de sistema y planes de salud. Why? Explain briefly. Although the case has been filed in favor of the indigenous communities, and the fine has been set, the environmental damages are too high and many people have been affected deeply by the harm of their territory. There can be no real compensation for the damages caused. Despite this, the case is an example of how justice in the judicial sense against a company can be achieved. What remains to be seen is if Chevron will ever pay a cent of the fine. Ejolt report "Towards a Post-Oil Civilization. Yasunization and other initiatives to leave fossil fuels in the soil"
Fontaine G., Más allá del caso Texaco ¿Se puede rescatar al Nororiente ecuatoriano?, Revista ICONOS, 2003. Maldonado A., Pueblos Indígenas y petroleras. Tres Miradas, Clínica Ambiental, Quito, 2013. Open letter from Dr. Rodrigo Pérez Pallares, representative of Texaco Petroleum Company, to the Director of Vistazo, on March 5, 2007, published in El Comercio on March 16, 2007, pag. 6 of Cuaderno 1. (2008, Jul. 4). Cable 08QUITO323: Chevron disputes report by Ecuadorian environmental expert. Released by Wikileaks. Hong, N. (2015, Apr. 19). Chevron, Donziger to Face Off Over $9.5 Billion Judgment. The Wall Street Journal [digital edition]. Hinton, K. (2012, Feb. 23). Chevron's Arbitrator Suffers from Acute Ethical Problems, Ecuadorians Assert. Amazon Defense Coalition. Eshelman, R.S. (2015, Apr. 15). The Chevron Tapes: Video Shows Oil Giant Allegedly Covering Up Amazon Contamination. Vice News.